The user-friendly SC-1919 Colorimeter is the direct reading colorimeter for complete onsite water analyses. All pre-programmed tests can be run on this compact instrument and each test features automatic wavelength selection. The entire multi-LED optical system is embedded in the light chamber and optimized for OMEGA test reagent systems. This enables the analyst to simply select the test and put in the sample with reagent. The microprocessor, which selects the wavelength, also allows the user to load up to 10 tests for analyzing custom reagent systems. 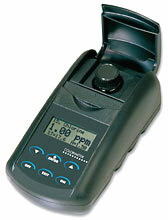 The SC-1919 Colorimeter is a portable, microprocessor controlled, direct reading colorimeter. It has a graphical 4 line, 16 character liquid crystal display for graphical, alphabetical and numerical messages. The operation is controlled with the keypad through menu driven software in response to selections shown on the display. The test library consists of 100 tests (not all 100 may be available at present) and 10 “User Tests”. The tests are precalibrated the reagent systems. The colorimeter displays the results of these tests directly in units of concentration. The 10 “User Tests” may be used to enter additional calibrations. All of these tests may be arranged in any of 3 sequences. These sequences can be modified a limitless number of times to meet changing testing needs. The optics feature 4 different colored LEDs. Each LED has a corresponding silicon photodiode with an integrated interference filter. The interference filters select a narrow band of light from the corresponding LED for the colorimetric measurements. The microprocessor automatically selects the correct LED/photodiode combination for a test. An RS-232 serial port on the back of the colorimeter, and optional software, allows the SC-1919 to be interfaced with a personal computer for real time data acquisition and data storage. This port also allows an interface with a RS-232 serial printer. Due to its portability, alternate power sources, and rugged construction, the SC-1919 Colorimeter is ideal for lab and field use. 참고: Comes complete with 4 sample tubes, AC adaptor, battery, and operator's manual.